If you are obese or overweight, you may have tried several different methods of losing weight, including various diets, or even medications or medical procedures. All of these can be helpful in their own ways and under the right circumstances. But you may want to consider adding a particular Japanese philosophy to your potential armamentarium, and that is the practice of Kaizen. Perhaps most importantly, understanding Kaizen means understanding that “big results come from many small changes accumulated over time,” as the Kaizen Institute notes. Both individuals and businesses across all sectors have found ways to apply Kaizen, from productivity to healthcare to improved workplace culture. You can apply the principles of Kaizen to your weight-loss efforts, too. First, you must pick a weight-loss goal, and then you can take small steps toward it. There are so many ways to choose a weight-loss goal. Perhaps you want to base it on body mass index (BMI). Or perhaps you want to start with an aim to lose 5 or 10 percent of your excess weight—a percentage that studies have shown to be very beneficial to your overall health. It is encouraging to know that you don’t have to lose all your excess weight down to your ideal weight or BMI in order to see any meaningful health benefits. As noted above, research has shown that even a small amount of weight loss can result in big health improvements. In the famous Finnish Diabetes Prevention Study, researchers found that obese or overweight study participants who were able to reduce their body weight by at least 5 percent—along with reductions in saturated fat intake, increases in fiber intake, and an increase in exercise to at least 30 minutes per day—had a 58 percent reduction in their risk of developing Type 2 diabetes over 3.2 years of follow-up. That is quite a sizeable risk reduction and health impact from just a few small changes. Similarly, another landmark study, the Nurses’ Health Study, showed the many benefits of a small change as simple as taking a brisk 30-minute walk every day. 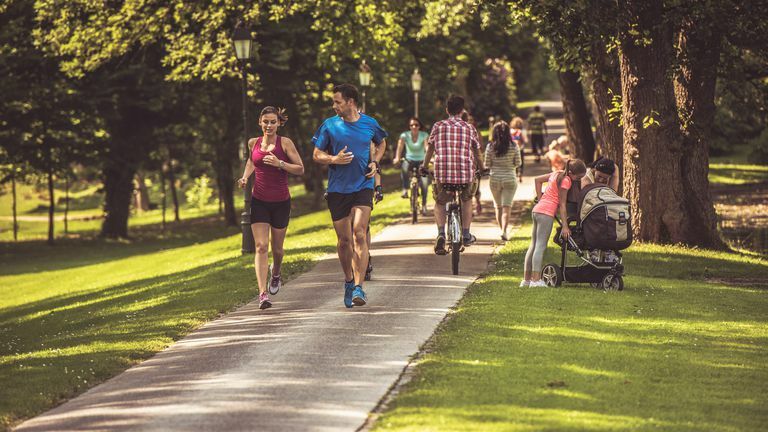 In that study, those who walked briskly or otherwise achieved moderate-intensity exercise for at least 30 minutes every day had a low risk of sudden cardiac death during 26 years of follow-up. In other research, scientists have found that losing just 5 percent to 10 percent of excess body weight can result in a 20 percent reduction in triglycerides (a form of fat in the bloodstream that is measured on a routine serum cholesterol panel; when triglycerides are too high, this can result in dangerous conditions like​ pancreatitis and heart disease). Yet another example of small changes adding up in a big way. Even small changes of just a few pounds can result in lower blood pressure as well. Many who lose enough excess weight are able to reduce or discontinue blood pressure medications because their blood pressure falls into the normal range just from losing weight. Let’s say that you set a goal of losing 10 pounds. (Maybe you want to lose more, but, in keeping with Kaizen, you set a smaller initial and more achievable goal, and then you can build upon that.) You then need to break that goal down into even smaller objectives—let’s say you are going to aim to lose just 2 pounds a week for 5 weeks. Now, that is entirely doable. But don’t stop there; losing 2 pounds per week won’t magically happen on its own. What small daily steps are you going to take to lose those 2 pounds? First, you may want to get into the habit of weighing yourself every day (for how else will you know whether or not you are reaching your goal of 2 pounds per week?). Several studies have found that people who weigh themselves daily are more likely to lose weight (and more of it) than those who weigh themselves less than daily. Then you will want to make small, daily changes to your everyday lifestyle. Have a good look at the activities you do and the foods you eat on a daily basis: these add up over time. Are you sitting for more than 4 hours per day total? If so, you are leading a sedentary lifestyle, and you will need to make changes to make sure you move around more throughout the day. Some ways to beat a sedentary lifestyle include taking a daily walk, taking the stairs whenever possible, parking farther away from your destination, getting a standing desk, doing your own household chores, and taking public transit, walking, or cycling to get to work instead of using your car. You can even apply the principles of Kaizen to break down these mini-goals as well. Let’s say you want to become less sedentary. Make a smaller goal of taking the stairs once a day. That’s your small, daily change that will matter in the long run. Then, the important part: building upon the smaller achievements. Using the example above, let’s say you do, in fact, have a successful week in which you are able to meet your goal of taking the stairs every day. You can now add to that by making another goal of parking farther away from your destination (making sure it is safe to do so), so you have to walk a little farther. You add that commitment to your daily stair-climbing. And then maybe you add a 15-minute walk every day, with the goal of eventually getting to 30 minutes every day. You keep adding in small increments until you achieve your goals. And then your smaller goals beget larger ones. Let’s apply this concept to dietary changes: start by keeping a diary of everything you eat or drink in a single day. Then analyze the entries: do you see sugared beverages like sodas, energy drinks, or high-end coffee drinks on the list? If so, those are easy targets to eliminate. Start with those easy targets, and keep going. Step by step, objective by objective, and goal by goal. Suddenly, you will find that you have lost those first 10 pounds. And you will have the tools to keep going if you want to, using Kaizen to achieve your overall weight loss goals after all. Miller M, Stone NJ, Ballantyne C, et al. Triglycerides and cardiovascular disease: a scientific statement from the American Heart Association. Circulation 2011. Published online Apr 18, 2011. Tuomilehto J, Lindstrom J, Eriksson JG, et al. Prevention of type 2 diabetes mellitus by changes in lifestyle among subjects with impaired glucose tolerance. N Eng J Med 2001;344:1343-1350.